It’s important for every young man to have a tuxedo ready to go. Once you start getting up there in years, you just never know when a friend is going to get married or when a random invite to a gala event is going to enter your inbox. So you need to make sure you have a classy outfit, but why blend in with the rest of the boring black and white tuxes? Instead of getting lost in a crowd of fancy-pants penguin suits, stand out like a fresh blade of grass in the arctic tundra! 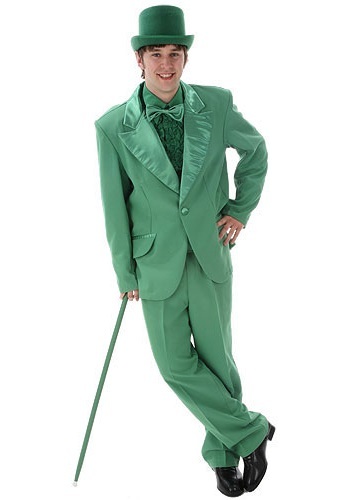 When you pop on this Men’s Greens Tuxedo Costume you’ll be the life of any party! Green is a super lively color that will put a smile on everybody’s face. It induces thoughts of growth, luxury, and nature, and who doesn’t love those things? Not anyone we’d want to hang around. Throw this green guise on and put people in a great state of relaxation. The calming shades of green that make up this tux will be a much-needed break from the sea of black and white for everybody at the next extravagant affair you attend. Grab a few accessories to add even more pizzazz to these spiffy duds. You’ll be sure to make everyone green with envy when you enter the party with a pair of dress shoes and a top hat that matches the rest of this classy outfit. Of course, if fancy events aren’t your thing then this tux will be perfect for a Halloween costume or for celebrating St. Paddy’s day. You can be the greenest guy in the gala or the most festive leprechaun running around the streets and it all starts with this Men’s Green Tuxedo!